Designed with a graceful and classical poise, this beautiful engagement ring from the Vera Wang LOVE collection features a halo design with a beautiful princess cut centre diamond. When viewed from the top the ring dazzles with the centre diamond wrapped around a double halo of smaller diamonds, connected with a crossover style on the left and right sides, demonstrating wonderful attention to detail in the metalwork. As an authentic Vera Wang piece, the inside of the engagement ring shank includes the Vera Wang LOVE inscription and her signature blue sapphire that sits underneath the setting. The carat weight of all diamonds combined 0.95ct. 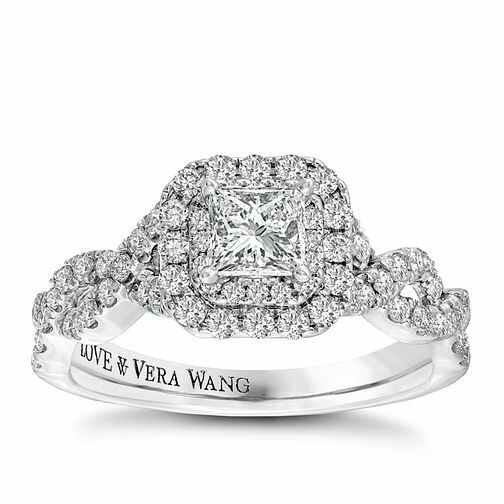 Vera Wang 18ct white gold 95pt diamond double halo ring is rated 4.8 out of 5 by 5. Rated 5 out of 5 by Anonymous from This ring is perfect! My partner chose this ring on his own, and I couldn’t have picked better myself! It is so sparkly and unique! I am constantly getting compliments on it wherever I go. It is amazing! Would definitely recommend this ring! From the packaging it comes in, to the way it looks on, it definitely doesn’t disappoint! Rated 5 out of 5 by Anonymous from Absolutely beautiful I can not explain how in love I am with this ring!! I have had it for just over a year now and I still find myself staring at it on occasion! I always get so many compliments! It fits beautifully next to my slim diamond wedding band. Really is a ring of dreams!